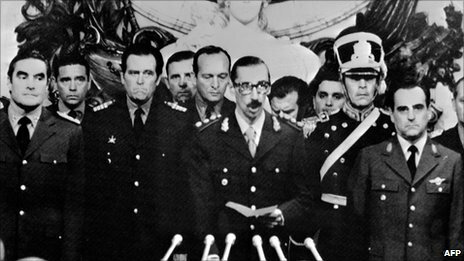 On this day in 1976, a military coup took place in Argentina. The democratically elected Peronist government headed by Isabel Peron was deposed and a military junta installed. The coup had been in the planning for about six months and American agencies had advance knowledge of the event. People are advised that from this date, the country is under the operational control of the Joint Chiefs General of the Armed Forces. We recommend to all citizens the strict compliance to the provisions and directives emanating from the military, security or police authorities, and to avoid all individual or group activities that will precipitate drastic intervention from the operating staff. (signed) General Jorge Rafael Videla, Admiral Emilio Eduardo Massera and Brigadier Orlando Ramon Agosti. People awoke to the news later in the morning. On the front page of Clarin, Argentina's most popular newspaper, people were advised that everything is totally normal. The banner headline reads: The military has taken the government. 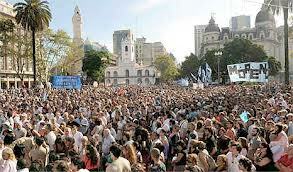 Although political repression began before the coup, it gained momentum in the months and years following. At the end of the dictatorship in 1982, over 30,000 citizens were disappeared. In addition, perhaps as many as five hundred children, born to disappeared women, who were kept alive only for the purpose of giving birth, were adopted by members and friends of the military junta. In 2002 the federal government declared March 24 the Day of Remembrance for Truth and Justice. The day became a national public holiday in 2006 and is marked by major official events and massive demonstrations throughout the country.